Prince Mortising Chain Sets are available in all sizes. Rates are very affordable. We also give quantity discount. 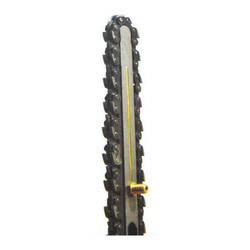 The Material Quality of Guide Bar, Chain Set & Sprocket is of the best type. Proper Jigs & Fixtures and Decent Machining on CNC Machines makes it the best set of Indian Market. We Assure You its Smooth & Silent Running as Shape of Sprocket & Chain Links are Properly Designed & Machined. We Take Special Care While DrIlling the Chains Links as it Controls the Pitch of the Chain. Annealing Process is Done After Heat Treatment of Chain Set toMaintainChain’s Required Hardness & AvoIding of Cracks in Hardest Wood or in Roughest Operations. The Chain Sets are Packed in specially made Thermocol Packing with Silica Gel to Avoid Rust & any Transport Damage for the Same. An Instruction manual is Provided with Every Packing of Chainset. Proper material, accurate workmanship make it world's best set. Prince Mortising Chain Sets are available in all sizes. Rates are very affordable. We also give quantity discount. Chain sets are packed very neatly in thermocol. Guide bar, sprocket, chain & instruction manual are standard parts in packing. Prince mortising chain sets are made with precision. Proper material, accurate workmanship make it world's best set. The material quality of guide bar, chain set & sprocket is of the best type. Proper jigs & fixtures and decent machining on cnc machines makes it the best set of indian market. We assure you its smooth & silent running as shape of sprocket & chain links are properly desgined & machined. We take special care while drilling the chain links as it controls the pitch of the chain. Annealing process is done after heat treatment of chain set to maintain chain's required hardness & avoiding of cracks in hardest wood or in roughest operations. Packaging Details: The chain sets are packed in specially made thermocol packing with silica gel to avoid rust & any transport damage for the same. An instruction manual is provided with every packing of chain set. Mortising Chain Set Prince 1/4" X 36 Links X1.3/4"
Mortising Chain Set Prince 3/8" X 36 Links X1.3/4"
Mortising Chain Set Prince 5/16"x36 Links X1.3/4"
Mortising Chain Set Prince 7/16"x 36 Links X1.3/4"
Handle The Chain Carefully As It Has Sharp Edges.We Recommend Hand Gloves To Avoid The Injury To Your Hands. Unplug Main Supply From Your Machine Before Fixing The Mortising Chain Set On Your Machine. After Setting The Guide Bar On The Machine, Make Connection Of Lubrication System To Guide Bar Nozzle. Don'T Run Chain Without Regular Lubrication Supply. Always Use 20-40 Grade Mobil Oil Of Any Good Company. Initially Don'T Over Tight The Chain On Guide Bar. Set Is Slightly Loose On Guide Bar, Then Run It Freely For Approx.5 Minutes Adjust The Guide Bar To Tighten The Chain As Chain Can Get Slightly Loose In Intial Working Hours. Don'T Touch The Chain Or Guide Bar Immediately After Stopping The M/C As It Can Burn The Fingers Due To Heat Generated By Friction With Wood & Guide Bar. Tight The Wood Properly With Clamping Screws Before Mortising The Wood. Never Try The Mortising Operation Without Clamping The Wood As It Can Cause An Accident. After Mortising The Wood, Switch Off The Machine Then De-Clamp The Wood.Never De-Clamp The Wood While Running The Chain. Chain Can Speedly Bounce The Job, Resulting In Accident. If Mortising Operation Is Taking Over Pressure Or Chain Is Producing Smoke Or Making An Unpleasant Noise, Check The Chain Edges. If These Are Blunt Then Re Sharpens The Chain In Proper Shape. Always Re Sharpen The Chain From Its Front Face Don'T Overheat The Chain While Grinding. A Slight Grinding Is Sufficient To Sharpen The Chain. Don'T Run The Machine Without Chain Cover Provided On Machine. Wear Safety Glasses, Goggles To Protect The Eyes From Wood Dust Generated By Chain During Mortising. Mortising Chain Set Prince 9/16"x36 Linksx1.3/4"
Mortising Chain Set Prince 5/8"x36 Links X1.3/4"
Each Chain set is packed in special Thermocol packing with silice gel to avoid rust and transportation damages. An instruction manual is provided with every packing of chain set. Mortising Chain Set Prince 3/4"x36 Links X1.3/4"